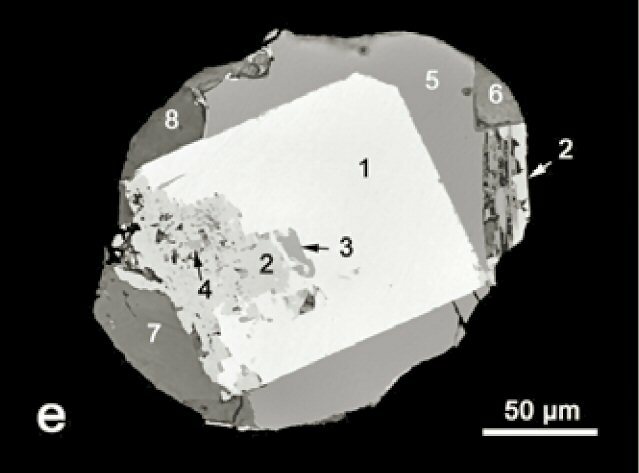 Comments: Polyphase grain of (1) ferroan platinum corroded by (2) Pt(Fe,Cu) and overgrown by (5) telluropalladinite, an unknown (6) Pd-Te-Fe-Si-O phase, (7) Fe-hydroxide and (8) a Ca-Mn-Fe silicate with inclusions of (3) kotulskite and (4) keithconnite. (BGR). Location: Stream sediments of rivers in the vicinity of the original discovery of the Merensky Reef on the farm Maandagshoek close to Burgersfort in the Eastern Bushveld, South Africa..